Walt Disney started his foray into all live-action film making with British Adventures like Treasure Island and The Story of Robin Hood. As he branched out into other styles and genres, he abandoned these roots and hadn't made one in that style since 1960's Kidnapped. While he continued to make films abroad, they became less adventurous and more heartfelt in nature. Perhaps feeling a bit nostalgic, he drew inspiration from a novel called Red Hugh, Prince of Donegal by Robert T. Reilly, loosely based on a true story. British writer Robert Westerby adapted the screenplay, his last before retiring and after several for Disney including Greyfriars Bobby and The Three Lives of Thomasina. TV director Michael O'Herlihy directs his first of two Disney films. Peter McEnery was cast in the lead role after starring in The Moon-Spinners. Susan Hampshire was cast opposite him after playing the beautiful witch in The Three Lives of Thomasina. This was the last Disney film for both. All of the matte paintings were done by Peter Ellenshaw. The film was shot entirely in the UK, with interior sets filmed at Pinewood Studios. The film begins with opening credits and Scottish family crests over a green satin curtain. The story begins in Ireland in 1587, which is occupied by the English. There is a legend that "When Hugh succeeds Hugh, Irland will be free." When Red Hugh's father dies and he takes his place as leader of the O'Donnell clan, he has a plan to unite all of the clans and fight against the English. When Hugh and McSweeny are Hugh are invited aboard a British ship for what they think is a peaceful dinner, Hugh is taken captive because they were tipped off that they were planning to rebel and he was their leader. He is placed in a prison with other Irish rebels and with a little help, he is able to escape. However, he quickly ends up back in prison. McSweeny and his daughter Kathleen visit the prison and get the captain to agree to let her visit Hugh. On their visit, she professes her love for him and promises to wait for him to get out. He escapes again, taking several other prisoners with him. They spend the night with a family of nice ladies and narrowly escape an inspection by British soldiers. Meanwhile, the British invade Donegal and say they won't leave until Hugh turns himself in. He instead takes war against his own castle. After conquering his own castle, he takes the captain as a prisoner until the other Irish men are released from their wrongful imprisonment. The film ends with all of the clans celebrating inside the castle. 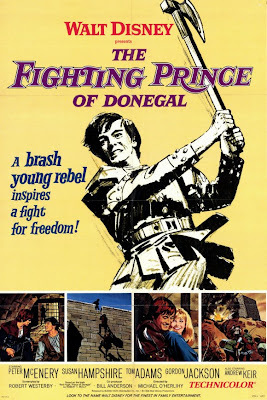 The Fighting Prince of Donegal was released on October 1st, 1966. Critics gave it mixed reviews. Those that liked it praised it for being a great family-oriented swashbuckler. Those that were harsh cited the liberties it took with history and the fact that the action was watered down to be suitable for kids. It wasn't a big hit at the box office and premiered on the Wonderful World of Color a year later in 1967. It was released on home video in 1986. Compared to other Disney films of this nature, it's much better than Rob Roy, but not as good as The Story of Robin Hood or Kidnapped. While there are comedic bits, none of them are very funny and the film is plagued by a slow pace. The most enjoyable part of the story for me was the budding romance between Hugh and Kathleen, but it doesn't get much screen time. The actors all give great performances, but the film would have benefited from a few scene omissions to keep the pace up. The production is lavish with many big sets made just for this film and many action sequences. The fact that it cost so much to make and didn't turn a profit made it clear to the studio that they should get out of the swashbuckler genre, and indeed they wouldn't make another for several decades until 1993's The Three Musketeers. 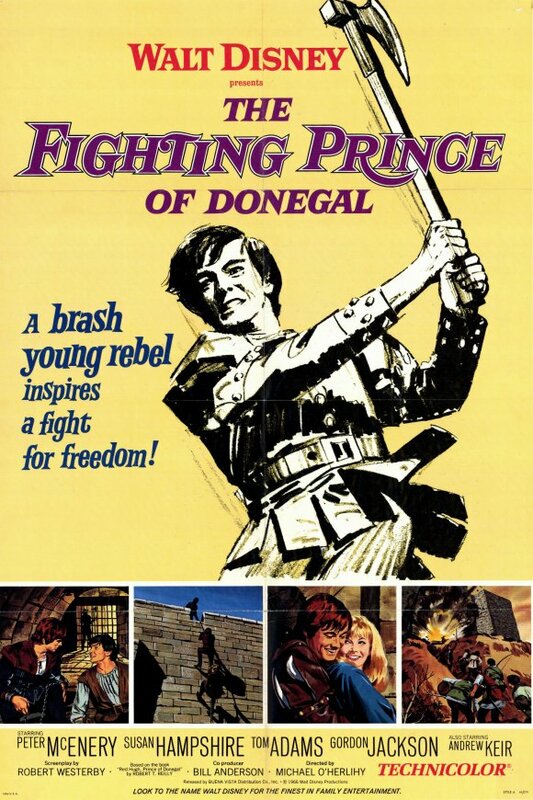 The Fighting Prince of Donegal is currently available on DVD as a Disney Movie Club Exclusive. The film is presented in fullscreen, although its original theatrical aspect ratio was widescreen 1.85:1. A restoration has been done and the print is free of major flaws and excess grain. There aren't any bonus features. The film is also available on iTunes, for those who aren't opposed to owning movies digitally. The iTunes release is the same fullscreen presentation used on the DVD.